"The Taking of Buda, 1686" in the Deutsches Historisches Museum. 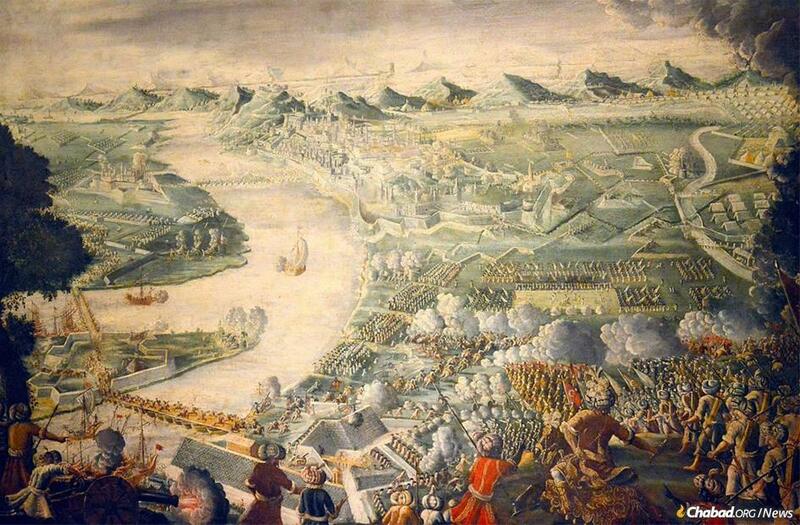 The victorious Christian invaders destroyed the Jewish community of Buda, along with their Muslim neighbors. In the summer of 1686, the Jewish community in Budavár (the ancient nucleus of modern Budapest) was laid to waste by victorious Christian fighters, who had laid a lengthy siege on the city, which had previously been held by Turkish Muslims. Many of the city’s Jewish denizens were raped, murdered or sold into slavery, and their three synagogues burnt. One of those synagogues, situated near the “Jewish gate” of the walled city frequented by Syrian Jews, was discovered in 1964 and made into a museum. Known informally as the Buda Castle Synagogue, it is believed to have been built in the 13th century. In 2018, the EMIH (the umbrella organization associated with Chabad Lubavics of Hungary) was invited to revitalize the building and make it into a thriving center of Jewish life once again. This past Shabbat, the Buda Castle synagogue was the site of a joyous bar mitzvah, the first to be celebrated there in 332 years. The young celebrant, Yonatan Sebok, is a student of Rabbi Asher Faith, the Hungarian-born rabbi who leads the now-flourishing congregation. Yonatan Sebok, above, was the first boy to celebrate his bar mitzvah in Buda Castle Synagogue since 1686. 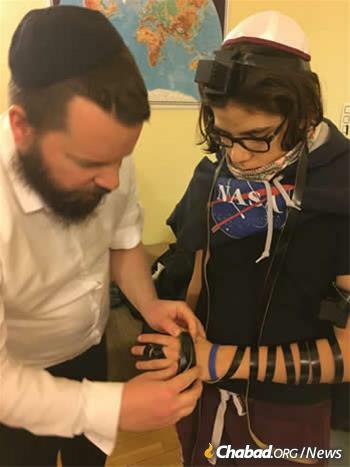 Here, he puts on tefillin with Rabbi Asher Faith. The congregation has been gaining attendees every week, reports Faith, drawing local Hungarian-speaking Jews, Israeli expats and even an Australian Jew who has taken to its charming vibe. In a sense, the congregation’s rise from the abyss reflects the rabbi’s journey. Raised in Budapest in the 1990s and vaguely aware that he was Jewish, he had no interest in religion and planned to become a journalist. Even after his older sister and twin brother became more involved in Judaism and attended Chabad events and services, he demurred. After he finished high school, he decided to check out the Friday-night meals that had so captivated his siblings. “I came for the food and to be entertained by the ‘crazy’ American yeshivah students who danced with such joy, but it had nothing to do with me,” he told Chabad.org. His turning point came when Rabbi Slomó Köves (also a red-bearded Hungarian-born Chabad rabbi) invited him to attend Pesti Jesiva, the Chabad rabbinical school Rabbi Boruch Oberlander had founded in the Szász Chevra synagogue on the Pest side of the city (Budapest was formed by the merger of Buda and Pest, divided by the Danube River, in 1873). “I came for a day and stayed for two years,” says Faith jovially in a lilting Hebrew laced with a strong Hungarian accent. 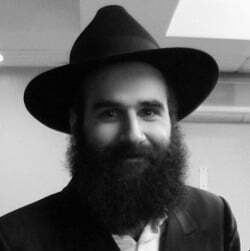 In 2010, now married to his French-born wife, Racheli, the young rabbi returned to the city of his youth and joined the team of Chabad-Lubavitch emissaries led by Rabbi Boruch and Batsheva Oberlander, who founded Chabad in Hungary in 1989. Alongside young people, his presence is felt in other segments of the Budapest Jewish community, which numbers as many as 100,000-strong. He gives classes in nursing homes, visits local prisons and organizes an afternoon yeshivah. The ancient synagogue joins four other synagogues run by Chabad in the Pest side of the Danube is the second to be reopened by Chabad in Buda side. The stately Óbuda Synagogue was been built in 1820 and became a television studio in the 1970s. In 2010, under the leadership of Köves, it was returned to its original sacred purpose. Faith greets dignitaries who came to celebrate his installation as rabbi of the ancient synagogue. When news spread of the impending return of the Castle Synagogue, members of the Óbuda congregation sponsored a new Torah scroll to grace its newly constructed ark. Held in September, the official reopening of the synagogue and installation of Faith as its spiritual leader was attended by Hungarian President János Áder and Chief Rabbi of Holland and Representative of the Rabbinical Centre of Europe Rabbi Binyomin Jacobs. As the hundreds of guests stood reverently, accompanied by a lone violinist, Köves and Faith sang Szól a Kakas Már, the haunting Chassidic melody that has become the unofficial anthem of Hungarian Jewry. Composed by the beloved Rebbe of Kalev (Nagykálló), the song couches the Jewish people’s yearning for Moshiach in the allegory of a peasant wishing to be reunited with a beautiful bird of the most exquisite colors. The rabbi didn’t have to wait long before people began attending the synagogue. Faith flanked by young Hungarian Jews, many of whom attend his classes or other events. Rosh Hashanah saw every seat filled and many more crowding the vestibule, eager to partake in the spiritually uplifting services. Every Shabbat begins with an hour-long class on another Jewish topic, and every service is preceded by a five-minute talk that sets the stage for a meaningful prayer experience. Despite being the oldest functioning synagogue in Hungary, the events under its arched stone ceiling are fresh, relevant and attractive. A kosher whiskey-tasting included a presentation by a connoisseur and a talk from the rabbi on the challenges of producing kosher spirits. On 15 Shevat, the New Year for Trees, the rabbi addressed the significance of the day, and a chef prepared sangria and other fruit creations. An upcoming soirée will feature a sushi chef and a class on producing and purchasing kosher sushi. Looking ahead, the rabbi concedes that lack of space is an issue he’ll need to contend with in the coming months. But he is excited about what the future will bring. Following the confetti and celebratory activities of the bar mitzvah, the synagogue now prepares for another milestone: its first Jewish wedding since the Ottoman era. The small, albeit historic, synagogue is once again open for weekly prayers. Rabbi Köves leads the procession as Rabbi Faith carries in the new Torah scroll, flanked by Rabbis Oberlander and Jacobs. The ceiling features several Kabbalistic drawings painted during the Ottoman era. This stone was part of another ancient synagogue that had been discovered below the modern-day Buda Castle. As I spend most of my time now in Hungary and Europe, I can tell you that antisemitism is terrible. Its interesting though as the Jews were in Hungary before the Hungarians. They came with romans and also many after the destruction of the Temple came to Hungary to help the local leader of the tribe of dacia to fight against the romans and then the Jews settled here and co-existed with the tribe and the Hungarians didn't come for many years after that. So really the Jews have a right to be here. Okay, but Israel is our real home, but until then lets just do what we can, there are many here to help. In fact most of the people that run Hungary business etc are all Jews. Hungary is a very Jewish society and that's how it functions. I have cousins here who are jewish and hate the jews. What can you say to this. This is how they have been influenced. They have been totally influenced. So I try and help them but there is not much I can do for them. "I might add that Jews who feel completely assimilated into European culture, Hungarian or other, as so many Jews are, are not likely to pick up one day and move to Israel." I don't, even for a second, dispute your statement. Moshe Rabaynu met with the same resistance, when he announced that Freedom was at hand. When came the time, he led from Egypt, the 20%, who were willing to leave. When a ship is about to sink, the prudent take to the lifeboats, lower them and row away from the ship. Those, who refuse to leave the ship - it matters not why - must be left. For, when a ship sinks, the suction it creates can pull-under a lifeboat. The 80% of Jews, who did not prepare to leave Egypt, died during the Ninth Plague. Once the remaining 20% left, following Moshe, there was not a Jew to be found in Egypt. Jews have a long history of staying in places, wherein they have been murdered. Hungary is such a place. NO Jew should reside in Hungary. A day or two business visit is one thing. To live in such a place bespeaks not just intellectual blindness, but a blindness as deep as that Egyptians experienced during the Ninth Plague (See Sh'mos 10: 21-23). In Sh'mos. Jews were commanded to prepare to leave Egypt (Sh'mos 12:1-11). Rashi comments on Sh'mos 13:18, that only one-fifth (20%) of Jews left Egypt. The other 80% did not leave: they died by Hand of H-aven, during the Ninth Plague. They did not prepare to leave Egypt, because having lost the capacity to imagine being free, they disbelieved Moses. In places wherein Jews have repeatedly been murdered - most of Central and Eastern Europe - No Jew should dwell. These countries' residents - over many centuries - have made clear that a Jew's life is not safe. I don't see this as foolishness, but as courage. It is written that the "knowledge of the LORD will cover the earth as the waters cover the bottom of the sea..." How can this happen if we leave any place in darkness? My own "mission" in life would not be perceived as dangerous, and yet, G-d forbid, I could fall prey to any number of disasters tomorrow! I am a Yhudim who lives in Hungary, I was born in england though. I have read Sh'mos very carefully and you know when Moses spoke up for Benei Israel in the desert to protect them, this inspired me to stay and help those that really can't see as well what G-d wants of them. These people are a light in the darkness of such antisemitism. Hungarians generally are critians and are blinded by their critian leaders, they are antisemitic too, but I hope that by staying I have been able to help them see that Jews are generally peaceful people and just want to help It seems in some places to be having an effect. So please also remember G-d told them He will take them out of mitzrayim, but He hasn't told me or the others that He will be taking me out of Hungary just yet. Till then I and others will try and help G-d's people. Your point is excellent: Jew-hating is ineradicably embedded in Hungarian culture, as it is elsewhere in central and eastern Europe. No one can fix this. I so state, because of what is written in Sh'mos. Moshe Rabaynu did not want to return to Egypt. He knew first-hand how Egyptians' cruelties had warped the minds of his fellow Jews. He knew also, that most would not leave, even when it was possible to do. Moshe repeatedly entreated the A-mighty not to task him with returning to Egypt, in the hope that the A-mighty would cause all Jews to leave, when came the time. Moshe's resistance was not grounded in personal concerns: he did not fear for his own safety. Rather, just as Avrohom Aveenu insistently entreated on behalf of residents of S'dom and Amorrah, so Moshe Rabaynu entreated on behalf of Jews, most of whom had been totally crushed by the Egyptians' cruelties. -so proud and happy would love to visit !! May Hashemi bless them and let them grow -so beautiful-I will spread this to all my network and family! I visited the DOHANY Synagogue when I was there a few years ago. My Daughter, Jodie, took me back to where I was born, for the first time since I left. It was strange because I only knew the streets, but no one was living there whom I knew. I visited the house I lived in, I even went in, (people were home), they were watching TV, (YA-HA). In front of the building used to run a trolly car, that no longer was there, however, several cars were running the streets. I even traversed in the SUBWAY, THAT WHEN I LIVED THERE, WAS RUNNING ONLY ON one LINE.